Publishers are currently preparing their giveaway titles for Free Comic Book Day (FCBD), which will be on May 3, 2008. 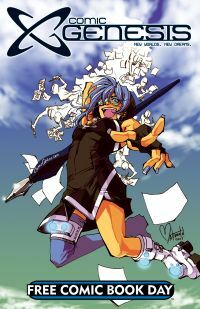 Three planned webcomic-related titles won’t be included, though, because even though their publishers participated in previous years, they were rejected for 2008. I’ve interviewed Chris Crosby about his reaction to this decision. How many years have you participated in Free Comic Book Day, and with how many titles? I represent three separate publishers. I’m co-CEO and co-owner of Keenspot Entertainment, which has been publishing comic books since 2001 (after being founded as webcomic publisher in 2000) and has participated every single year since the first Free Comic Book Day in 2002. We published an annual FCBD anthology called KEENSPOT SPOTLIGHT each year, and in 2004 we also published a special FCBD issue called SORE THUMBS ELECTION SPECIAL 2004. So that makes seven FCBD books from Keenspot from 2002-2007. Through Keenspot I’m also involved with ComicGenesis.com (formerly known as Keenspace.com), a community-run service that hosts and promotes the webcomics of aspiring comic creators for free. Comic Genesis has published four FCBD issues since 2003 under various names. As well, I’m Editor-In Chief of Blatant Comics, which has been publishing comic books since 1997. Blatant Comics first participated in FCBD last year (2007) with LAST BLOOD #1, the launch of a new horror adventure series that has since published three additional issues priced at $2.99. Did you plan to participate in FCBD this year? 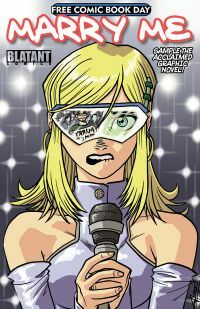 Keenspot planned another edition of KEENSPOT SPOTLIGHT, which in 2008 would’ve focused primarily on in-print comics as opposed to its standard mix of both in-print comics and only-on-the-web comics. The two titles it would’ve focused on are OUT THERE and SORE THUMBS, which together will have three $12.95 collections in stores by May (and additional volumes coming later in the year). ComicGenesis.com planned COMIC GENESIS 2008, an anthology title of some of the best Comic Genesis material combined with a how-to guide for aspiring creators telling how they can join ComicGenesis.com and get their comics published and promoted online for free. Blatant Comics planned MARRY ME FCBD EDITION, a full color 32-page issue which would showcase the first 24 pages of the MARRY ME graphic novel ($12.99) we’re publishing in April, a romantic comedy about a pop star who has a nervous breakdown and accepts the proposal of a random fan holding a “Marry Me” sign at one of her concerts. It also would’ve included an 8-page preview of an upcoming Blatant title. Will you be participating in FCBD this year? 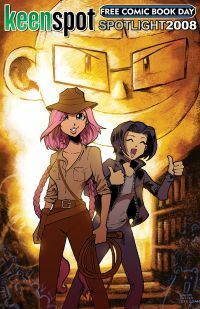 Some critics have questioned whether webcomic samplers should be part of FCBD. The day was created to drive new customers into comic shops to purchase material, and some feel that promoting free online comics is counter-productive to that goal. How do you respond to those critics? I don’t think they’re looking at the big picture. The promotion wasn’t a one-way street, it was CROSS-promotional. Carrying our titles may’ve been entirely optional to retailers, but even the ones who didn’t carry us benefited from our participation in the event. Just the online comics I specifically represent have over 3 million monthly readers online. According to Alexa Traffic Rankings, ComicGenesis.com alone is the 2,113th most popular website in the United States, ranked even higher than DC Comics’ website dccomics.com (#4,442) and catching up quickly to marvel.com (#1,811) for U.S. traffic. And it’s miles ahead of DC’s webcomics initiative ZudaComics.com (#31,949). Most of our 3 million+ readers do not read print comic books, not including print collections of webcomics. Not because webcomics are free and webcomic readers are cheap (the fact that so many of us are making a living from our readerships is proof of that), but because they haven’t yet been exposed to a print comic that interested them enough. When webcomics participate in FCBD, we are actively promoting the event to millions of readers. Those are potential new comic shop customers, assuming you can grab them enough with a title they’ll want to try while they’re in the store. They’re already used to reading comics regularly online, so there’s a much better chance of hooking them than it would be to hook the average non-comic reading person. Since we’re not being allowed to participate in FCBD 2008, we won’t be trying to drive our millions of readers into comic shops this year. The advertising space on our sites is valuable real estate and we need a beneficial reason to give any of it up for FCBD promotion. There are no records of how many readers we did actually drive into shops on FCBD over the past six years (that I’m aware of, anyway), but I’d be surprised if the number wasn’t significant. Why do you want to participate in FCBD? Why not? It’s a great cross-promotional event and it’s fun for everyone involved. Our print titles are promoted, our webcomics are promoted, comic shops are promoted, comic reading is promoted, comic creating is promoted… it’s the same reason you’d want to celebrate your favorite holiday. Free Comic Book Day seems to be the official holiday of comics. Or of printed comic books, anyway. It seems likely that we’ll go ahead with the publication of our planned FCBD titles as Comic-Con giveaways instead. But it won’t be the same. Johanna again. My thanks to Mr. Crosby for talking more about some of his decision-making process and his take on the cross-promotional benefits of FCBD. Based on my experience, I know that there were certain webcomic readers who would visit my local store on FCBD to get the samplers… but we could never convince them to spend money on anything, and they wouldn’t be seen until the next year’s giveaway day. But those are the types who stand out, and someone who does decide to come back and spend money is a lot harder to notice. What bothers me more is the FCBD committee and its lack of transparency. Have the members been publicly identified? I don’t recall seeing a list. This isn’t the first decision that’s been made under the radar without public announcement or comment. And using “current books sales not warranting the FCBD promotional support” as a reason… isn’t that another way of saying “the rich get richer”? I guess this is another sign of how webcomics and print comics don’t really have much significant overlap — and how some forces are driving them even further apart.